In the minds of most people, the American auto industry is synonymous with the Midwest (Detroit in particular). After having been left for dead many times since the 1970s, the Midwest still conjures up images of American heavy industry and assembly lines churning out cars. Indeed, the Motor City continues to be a major hub of automobile production in America, and heavy industry is still alive and well in parts of the Midwest. Quietly and gradually, however, America has witnessed the rise of a new manufacturing belt in an unlikely location: the American Southeast. For most of the 20th century, the region led the nation in something that can only be referred to as dubious superlatives. The Southeast was known as being the least-developed, least-industrial, least-educated and least-wealthy of the four major regions of the country. Outmigration, political strife, rural stagnation and general decline plagued the region when other parts of the United States were prospering. 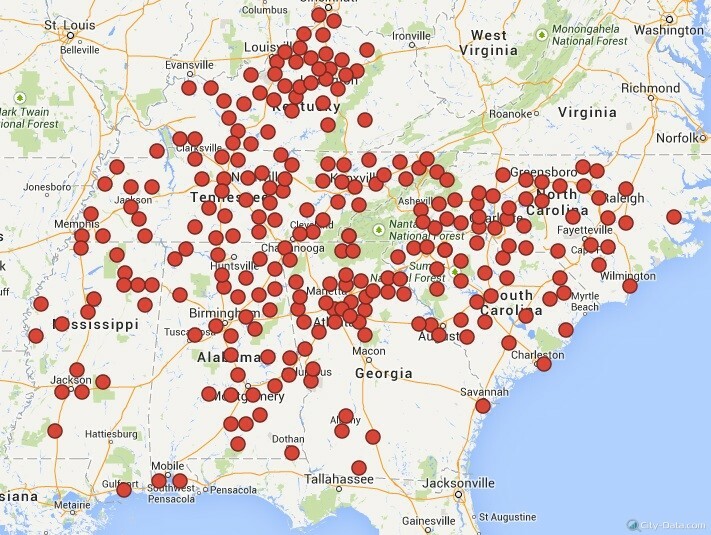 By the end of the 20th century and continuing into the 2000s, however, a “New South” started to emerge. Whereas agriculture, forestry and other low-wage industries previously dominated in many parts of the South, the New South became home to booming suburban housing developments, office parks and millions of new residents. 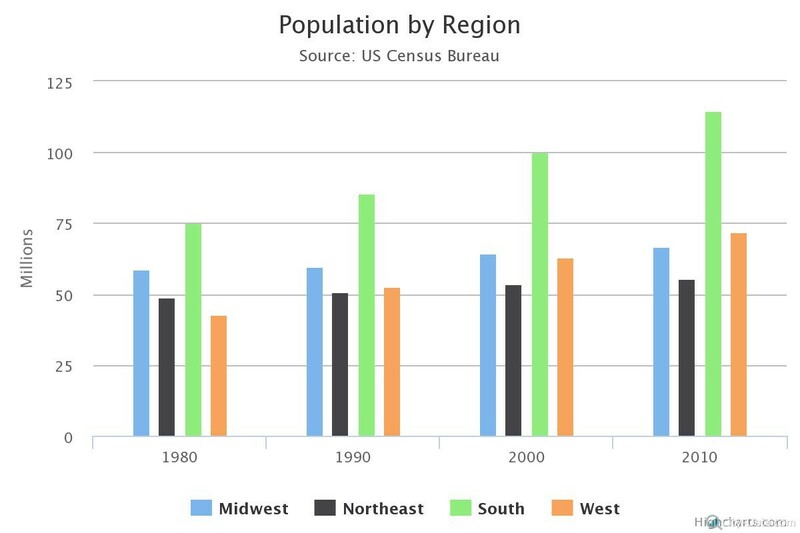 While the population in the Midwest and Northeast grew by 13 percent between 1980 and 2010, the population in the South grew by over 50 percent. One of the primary factors fueling the rise of the southern manufacturing belt is the automobile industry. Since the 1990s, the likes of BMW, Mercedes, Toyota and Kia have taken up residence in lower-cost, non-union states like Alabama, Georgia, Kentucky, Mississippi, North Carolina, South Carolina and Tennessee. In 2010, there were 51 establishments classified as “automobile manufacturing” or “light truck and utility vehicle manufacturing” facilities, with nearly half of those concentrated in Georgia and South Carolina. 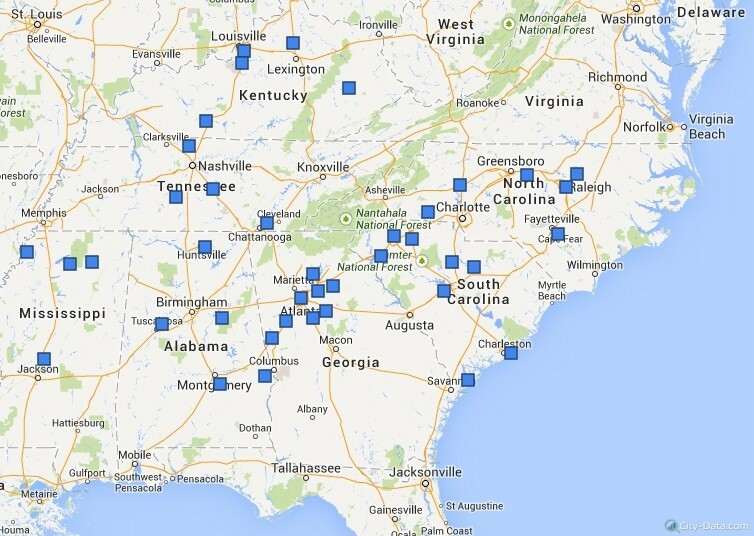 As the map below makes clear, there is a very distinct geography to the southern automobile belt. Namely, the bulk of the manufacturing facilities cluster around major transportation corridors, such as I-85 connecting North and South Carolina, Georgia and Alabama. Likewise, I-65 and I-75 create the north-south backbone of the industry, running from Kentucky in the North to Alabama and Georgia in the South. Perhaps even more indicative of the rise of the southern manufacturing belt is the cluster of supporting industries surrounding the various automobile plants. 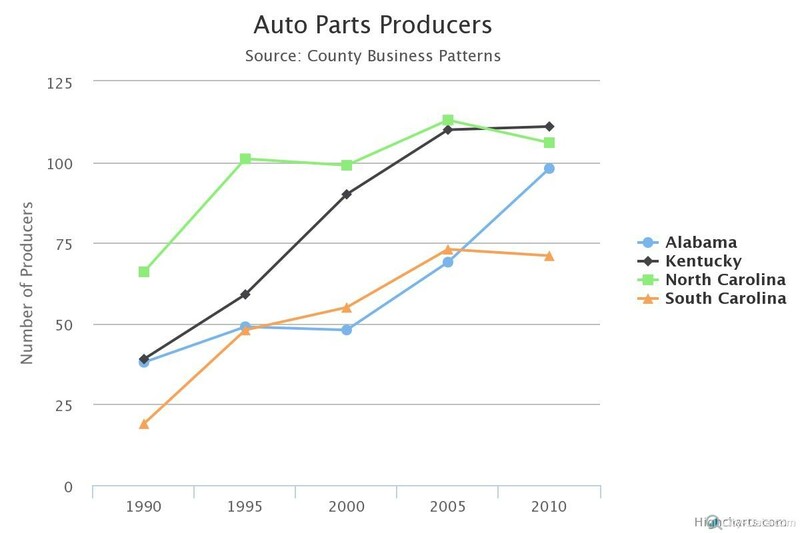 The number of establishments classified as a “motor vehicle parts manufacturer” has nearly doubled in the past 30 years, and has especially grown in Kentucky and Alabama. The geography of parts factories is far more diffuse than that of the automobile plants, but there are obvious clusters around the same transportation corridors that service the main production facilities. Compared to its counterpart in the Midwest, which is relatively concentrated, the southern manufacturing belt is more spatially extensive and highly dependent on the region’s major interstates. In fact, the scenery on a drive along any of these southern transportation corridors includes plenty of open, green space and long stretches without any major population centers. Indeed, all that available and easily accessible land is what attracted many of the new car factories and other industrial investors in the first place. Beyond the clusters of new manufacturing plants and active transportation corridors, there is another side to the South that indicates the region has yet to completely overcome the legacy of its past. For all of the new development and suburban sprawl, there are still vast sections of the region that have benefited very little or missed out altogether. As the two maps above demonstrate, eastern Kentucky, southern Georgia, western Alabama and a large proportion of Mississippi have far fewer car factories or part manufacturing plants than the rest of the region. Indeed, these are places that have experienced chronic poverty and have benefited the least from the transition to the modern economy. Transportation corridors are far less developed there, leaving many parts of the region isolated and much less attractive for new industrial development. Socioeconomic indicators gleaned from the United States Census are at least twice as high in the New South suburban communities compared to those on the periphery. Whereas many counties in the northern Atlanta suburbs doubled or tripled in population between 1980 and 2010, counties in parts of eastern Kentucky, southern Alabama and western Mississippi shrank by as much as 30 percent. In 2010, the per capita household income in places representative of the New South like suburban Nashville and Charlotte are three times higher than those in places that have been left out of the new development. It is not surprising, therefore, that more than one-third of the residents in the poorest places receive some form of public assistance, whereas fewer than one in ten need assistance in the counties that are better connected to the southern automobile industry. These trends tell us a few things about how the American South has changed and continues to change. First, manufacturing is still an important part of the American economy. In the South, the opening of new automobile factories has sparked the growth of hundreds of supporting industries in nearby counties. Second, just as manufacturing jobs related to the automobile industry helped the Midwest build a solid middle class throughout most of the 20th century, they strongly correlate with higher socioeconomic status in the South. The rise of the southern automobile is certainly not the sole factor related to the impressive growth of the New South, but it is important piece of the story. Finally, the places that have not been able to attract new automobile plants or parts suppliers continue to struggle, as they have for decades already. In many ways, these places that are left behind are representative of our modern economy that has seen the gap between the “haves” and the “have-nots” increase. For suburban and other accessible counties, investment in the automobile industry has helped close that gap. For other places, the solution remains to be seen. 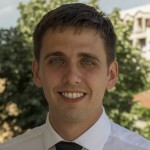 Benjamin is currently an Assistant Professor of American Studies at International Balkan University in Skopje, Macedonia. He received a Ph.D. in Geography from the University of Tennessee, where he also taught courses on Urban Geography, Appalachia and World Geography. His main academic interests are urban and economic geography in Europe and North America. Previous PostVaried opinions about feminism in the United StatesNext PostWhere to be born in the U.S.